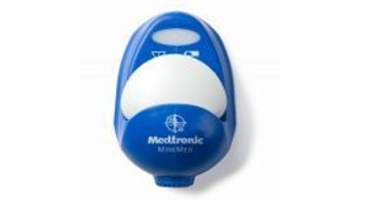 The MiniLink Real-Time Transmitter attaches to your body separately from your infusion set and connects directly to the tiny glucose sensor. The glucose sensor is discreet, easy to insert, and virtually painless. The MiniLink Real-Time Transmitter wirelessly sends your glucose data from the glucose sensor to the insulin pump every minute (The MiniLink Real-Time Transmitter is the part of the Medtronic Minimed Paradigm Real-Time System that transmits data from the glucose sensor to the Medtronic Minimed Insulin Pump). An updated glucose value is displayed on the insulin pump every five minutes, meaning that it gives 288 readings in a 24 hour period. Comfortable: The Real-Time Transmitter is tiny (about the size of a quarter), lightweight weighing less than ¼ ounce, ergonomically shaped to move with you, and it has a small adhesive area about the size of a postage stamp.